Letter dated 23 March 1898 sent by Nathan Perry Dawley at Lawrence, Massachusetts, to George. Sadly, the letter was found without its envelope. Agreeable to promise I take this time to write to you a few lines to let you know that I have had a talk with Julia about the place I was thinking of bidding on and she says she don't want to live up there under no considerations. She don't want to live anywhere near Emma or Charlotte and I don't suppose either of them wants to live near Julia. You might see Mrs. Burton and tell her I don't want the place. We are all well and hope this will find you all the same. Jesse has got a good job in the Shoe Shop and He likes it very much. This is all at present. There's definitely a story there! I wonder where "up there" was? New Hampshire or Maine? Nathan Perry Dawley was born 4 October 1849 at Jewett City, Connecticut, son of Nathan and Lucretia (Jackson) Dawley. He married twice, first to Syrena Cates, and then to Julia A. Rich, presumably the Julia mentioned in his letter. With Julia, he had, I think, eight children. 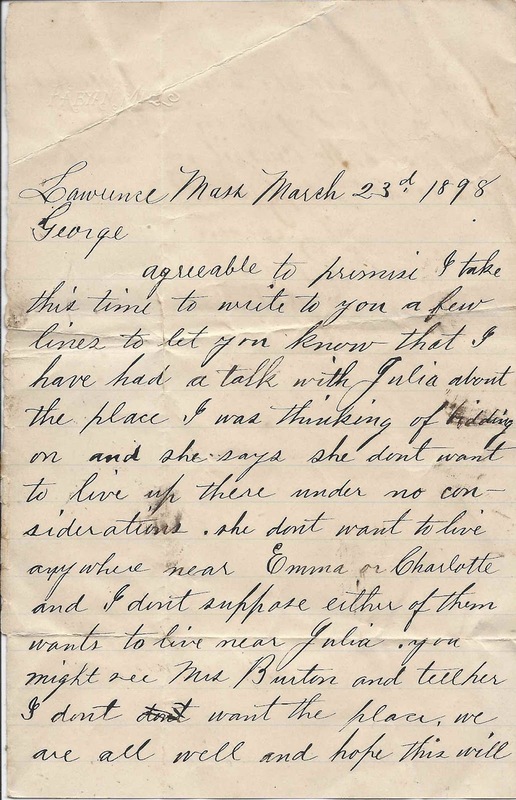 One of the children was named George, but he was not the George to whom the letter was addressed, because of his age and because Nathan called Julia by name. Nathan had a younger sister named Emma Jane Dawley, who was perhaps the Emma of the letter. Nathan had a son named Jesse Nathan Dawley, born 31 March 1883, who is likely the Jesse mentioned in the letter. Jesse was still working in the shoe industry a couple years later when the 1900 Census was taken, and in later years as a carpenter and as a foremen for the railroad. If you have corrections to the information above or any details to add, please leave a comment or contact me directly. Wonderful and thankful for your post. This is my family member.